F. (Francisco) Sionil José, writer and publisher, founded the Philippine Center of PEN, an international organization of poets, playwrights, essayists, and novelists. In 1965 he established the publishing firm Solidaridad and edited the journal, Solidarity. His work includes eleven novels, five books of short stories, a book of verse, a collection of stories for children and four books of essays. His five-novel Rosales saga consisting of The Pretenders, Tree, My Brother My Executioner, Mass, and Po-on have been published in the United States and translated in various languages in Asia and Europe. 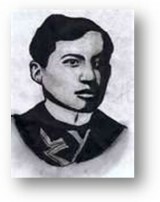 José has received numerous fellowships, honorary Ph.D’s and awards, which include: the Ramon Magsaysay Memorial Award (1980); the Cultural Center of the Philippines (CCP) Centennial Honors for the Arts (1999); the National Artist Award for Literature (2001); and the Pablo Neruda Centennial Award (2004). Thank you so much. im 5o yrs old and im here now in Italy. Just today i learned the story of Rizal Monument. Nakakahiya, but i need to admit. Missing so much the Philippines, we got the best country in the world, not to mention what is happening now ( so sad). Yesterday we attended the unveiling of the new statue of Dr Jose P Rizal here in Piazalle Manila, Rome. The scupltor, Sir Tom Concepcion was with us. God Bless Philippines and the Filipinos.